The stunning island scenery is characterised by steep mountains, rolling peat low lands, sandy shorelines and extensive sea cliffs. Located off the West coast of Co Mayo, Achill Island is Irelands largest Island. The stunning island scenery is characterised by steep mountains, rolling peat low lands, sandy shorelines and extensive sea cliffs. The Island is connected to the mainland at Achill Sound by the Michael Davitt bridge. Originally built in 1886. Achill Island has numerous Blue flag beaches. The most famous of these located at Keem Bay and Keel stand. The island has a stable population of 2700. In the summer months Achill is a popular destination for domestic and international tourists. Achill Boasts a large range of historic sites including megalithic tombs, Grainne Mhaol’s castle, the Great Western Rail corridor, Achill Henge and the Deserted Village at the foot of Slieve Mór, one of Achill’s highest mountain. Achill’s Atlantic drive offers a scenic route around the island’s coastline, splendid examples of coastal erosion and deposition, including hidden beaches and sheltered bays, sea cliffs, sea caves, stacks and arches. The local villages of Achill Sound, Dooega, Dooagh, Keel, Dugort and Bunacurry offer a range of services to the local island population and holiday makers during the summer months. Achill is a hive for literary and artistic talent both historically and in modern day terms, the most notable of these was Heinrich Boll, the famous German Writer who resided on the island for periods from 1950 to 1970. Achill is currently home to a number of artists, poets, writers and sculptors. Who offer a range of art galleries and exhibitions throughout the Island. The village of Dooega located on the South Western side of the Island is an Irish speaking village or Gaeltacht area. Residential summer courses are available in the village for students throughout the country, promoting Irish culture, language and activities. Scoil Acla in the village of Dooagh offers musical and cultural activities and lessons for children during the holiday season. For holiday makers the Island offers a broad range of accommodation, including B&B’s, hotels, guesthouses, hostels and self-catering homes and apartments. Keel village beside Keel beach is the primary tourist hub on the island with a range of café’s, pubs, campsite, golf course and playground available to tourists. Keem Beach is one of the most visited features on the island. Accessible via a narrow road along the side of Croaghaun mountain, the hidden beach is regularly touted as one of Irelands most picturesque beaches. Keem Bay is also famous for its basking shark population who regularly visit the bay during the summer months and are visible from the shoreline. A range of activities are available on Achill. 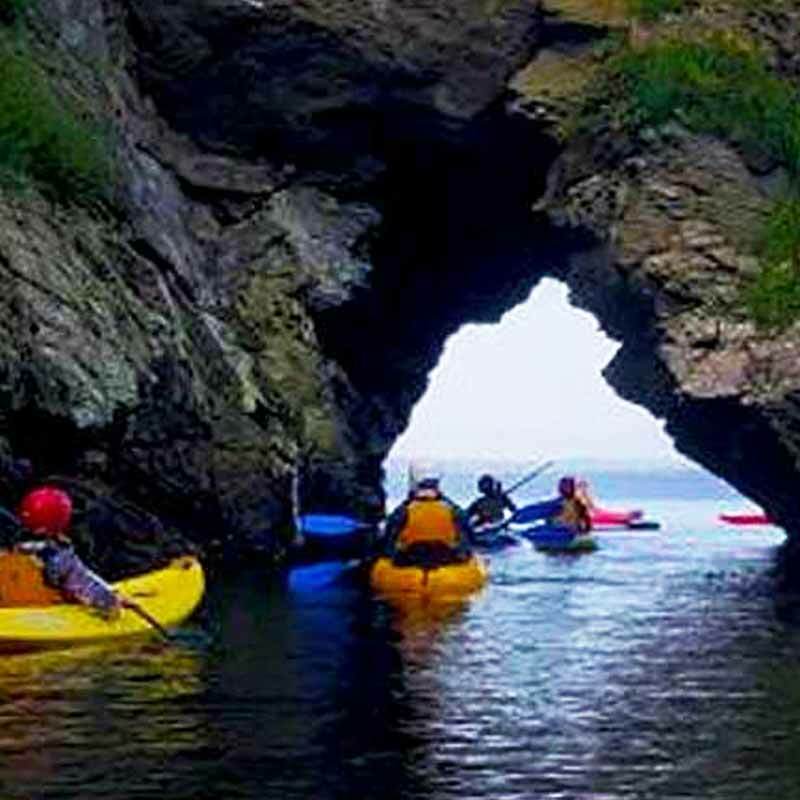 Due to the wild terrain and coastal landscape Achill is a popular location for adventure activities and water sports. Local beaches and lakes offer perfect locations for surfing, kayaking, sea kayaking, wind surfing, kite surfing, stand up paddle boarding, diving, fishing, sailing and other water based activities. 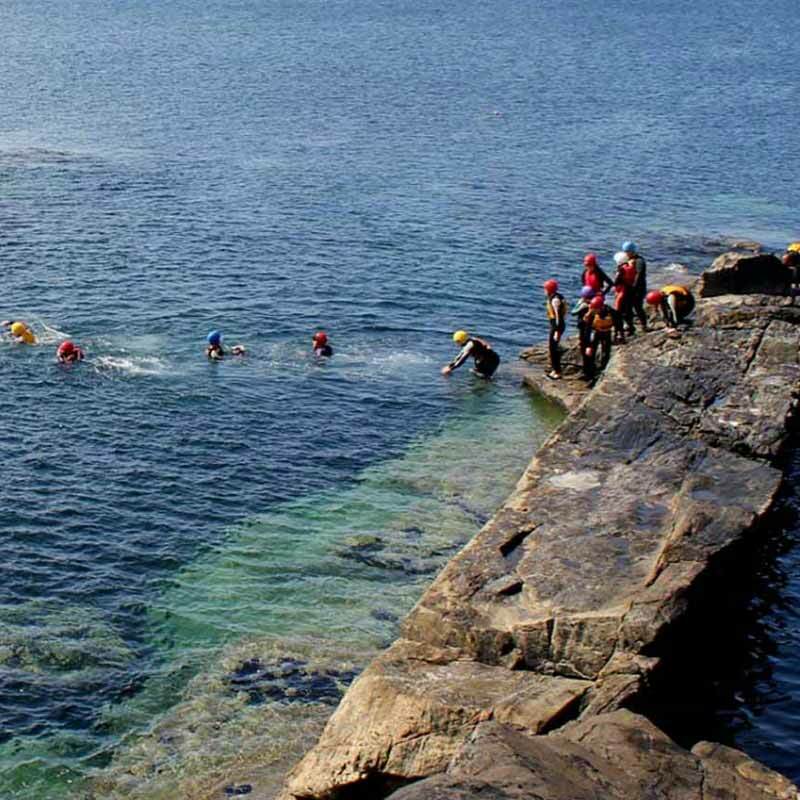 A range of land based activities are also available in the region, including horse riding, mountaineering, cycling, golf course, pitch and putt, orienteering, ATV track, archery, mountain boarding and rock climbing/abseiling. The Great Western Greenway is an off road cycling track from Achill to Westport, this route offers a safe path for cyclists off the main roads in the region. The island also offers a heritage centre, aquarium and range of other indoor activities and workshops for children and adults. All beginner surf lessons must teach pupils the basic movements and principles about catching and surfing a wave. These skills must then be developed and honed over time to better ones surfing fitness and ability.